Sisters Scarlett and Rosie are as close as two sisters can be, especially since Scarlett saved Rosie from a Fenris, or werewolf, in an attack that left their grandmother dead when the girls were children. Now eighteen and sixteen, Scarlett is a devoted and focused hunter of the Fenris, and with her partner Silas, the woodsman's son, is determined to take down every werewolf that crosses her path. Rosie, however, isn't so sure that the life of a hunter is for her, and when she falls in love with Silas, it becomes harder to tell Scarlett what she really wants, especially when the sisters and Silas move to Atlanta, hot on the trail of the Fenris, and determined to stop them from turning the human they're after. Sisters Red is an excellent fairy tale retelling with a modern twist! Pearce's voice is quite sophisticated; her writing can be magical and engrossing one page, and then seamlessly contemporary and witty the next. The dynamics between Scarlett and Rosie are excellent; the sisters are very close and know each other as well as they know themselves, but through alternating viewpoints Pearce does a wonderful job at expressing how they both want different things in life and how hard it is to communicate that to each other. The story gets a bit philosophical as well when Scarlett uses an old story their grandmother told them (a version of Plato's Myth of the Cave) to express how she feels about her choice to hunt the Fenris, and that adds depth and thought to the novel. 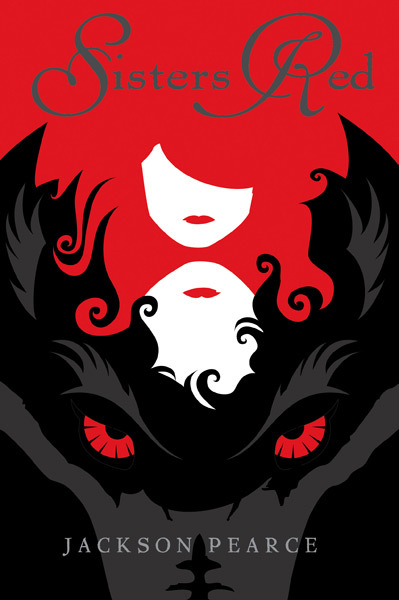 Though the big twist of the story was a little predictable and can be guessed pretty early on in the story, Pearce does an excellent job drawing out the drama between Rosie and Scarlett, the sweet romance between Silas and Rosie, and revealing bits and pieces of the Fenris and how they operate throughout the book. There are plenty of sharp action scenes and a tense, suspenseful showdown at the very end makes it hard to put Sisters Red down. This is an excellent and engrossing novel with two smart and powerful heroines that readers can look up to. Cover Comments: This cover is so clever and pretty--I love the bold graphic style, and the many different images--the girls, and the wolf. Nothing beats seeing this cover for the first time!